Interesting thing up for Skype users on Windows 8 – an update is here. 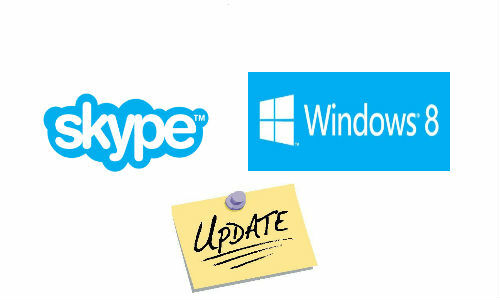 Skype for Windows 8 has been updated to give users more control over who can contact them, courtesy contact blocking. Users can now block contacts, if they choose to, thereby deciding their circle of contacts on the popular VoIP platform. Users can block contacts on Skype by first selecting the person's name so it opens up the chat window. Swiping at the top or bottom of the screen (or right click) prompts the command bar with an option to block the contact. Alternatively, users can also choose to remove or report the contact request as spam. Skype goes on to add that the updated app features better loading speed and reliability. That's not all, Skype confirms that its newest release features some fixes for some issues that existed in the previous version. The issue wherein, in some cases, the outgoing video would not show after switching camera in the Options menu has been fixed. In some cases, Skype displayed incorrect call error message when a call failed. This issue has also been fixed now. Skype also crashed at times when users clicked the "info" menu option. That glitch also has been fixed now. The issue with Skype crashing when "batch" would be typed in the IM input field has been fixed. Earlier, it was not possible to switch between calls on hold. Skype says that has been fixed now. Skype has been doling out updates for its app across platforms regularly. Earlier last month, the Skype app for iPhone and iPad users was updated to version 4.6. The Skype iOS app was updated to include a new calling experience. Users can mark all their recent chats as "read" in a matter of a few taps. One-to-one chats appear in the correct order in the app now. The updated iPhone app too includes the above mentioned features. Skype for iPhone v4.6 is compatible with the iPhone 3G, iPhone 3GS, iPhone 4, iPhone 5, plus 2nd, 3rd and 4th generation iPod touch. iOS 5.0 or later is required on all devices. Skype for iPad v4.6 is compatible with the iPad, iPad 2, iPad mini and the latest iPad with Retina Display. Skype also resolved a host of previous issues. The dial pad and in-call buttons now appear fine when a user taps on the screen during a call. The popover will be removed from the incoming call screen. Messages that are non-edited will not be marked as edited, once the save option is pressed. Skype is also currently working on fixing a number of issues. First among these is the issue wherein the last scroll position of the user is not saved. If the user has added a phone number to his profile while chatting, the Chat/SMS toggle button currently is not displayed until a user logs in again. The issue preventing a user from reading unread messages in iPhone is being worked upon too.